Ujjayi Pranayama (yogic breathing technique) is also known within yoga as ‘the psychic breath’ It is produced by a light contraction at the pit of the throat around the glottis. The glottis affects voice modulation through expansion or contraction. Contracting the glottis lightly like this creates a light whispery, snoring sound on the inhalation and the exhalation. This particular way of breathing has been harnessed by Yogis for untold generations to support and promote health as well as expand conscious awareness through Dharana – the concentration aspect of meditation practice. The impact of the Ujjayi breath can be both deep and pervasive. On a physical level, Ujjayi breath allows more oxygen to be transferred in the lungs, enhancing the flow of blood throughout the entire body similar to what occurs during periods of increased exercise. The difference is when this pranayama is performed, the physical body becomes very relaxed, so the body and brain are able to reap the benefits of increased blood flow without the stress and wear caused by higher level exercise. Ujjayi breath lowers blood pressure due to creating light pressure on the carotid sinuses. The Carotid sinuses are responsible for regulating blood pressure within the arteries. Lower blood pressure supports health and longevity as well as being naturally calming for the mind. Any pranayama in general works to correct and improve the rhythm of the breath. When performed with a high level of focus, Ujjayi Pranayama brings the breath into a solid rhythm. The added consciousness feedback of the sound created with this technique helps to reinforce the calming benefits of the rhythmic pattern. We are at once hearing, feeling, and aware of the benefit of the breath. This equates to a deep impact on the conscious, subconscious and unconscious levels of mind. When the mind is racing or processing stress, it is accepted that the body will be responding in kind. Heart rate can speed up, blood pressure may rise, muscles will likely tighten, and most often the breath switches from nose breathing to mouth breathing. We may also switch from diaphragmatic breathing to shallow breathing where the shoulders and chest begin to move. These are all physical signs that the sympathetic nervous system is becoming activated, kicking into ‘fight or flight’ mode. Similarly, if the body has been patterned to shallow breathing and remaining in tension, this affects thought forms and emotion. It can make the mind race and thoughts lean more towards the negative than the positive. Emotion will be heightened and lead more towards the unpleasant. Not only is this a ‘chicken and egg’ cycle, it’s also a cycle that can become very engrained due to the involvement of muscle memory and the deep seated self-perpetuating, emotional impressions known in Yoga as Samskaras. Ujjayi breathing stimulates the Vagus Nerve. 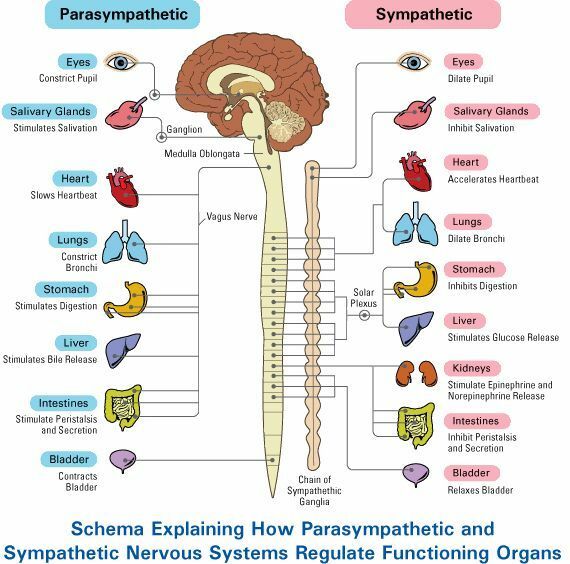 The Vagus Nerve is the heart of the parasympathetic nervous system. It’s the 10th cranial nerve. It controls the organs of maintenance – the heart, digestion, breathing and glands. Twenty percent of the fibers of the vagus nerve do that. The rest send information from the gut to the brain. Ujjayi breathing emphasizes the input from the viscera (abdominal organs) to the brain and this dramatically changes how your brain is working. If we just do a slow breathing rate (2 to 4 breaths per minute), the Vagus Nerve will switch on. However, combining it with light resistance (as in ujjayi) further enhances the input the Vagus Nerve has in the brain. Incorporating Bhandas (energy locks) also further activates the Vagus Nerve and releases nitrous oxide within the body and brain. Nitrous oxide is released by the nasal sinuses, and has been found to act as an anti-inflammatory, hormonal and antiseptic. It is also a repair agent for the entire respiratory tract, bloodstream, digestion, and delicate lung tissues. 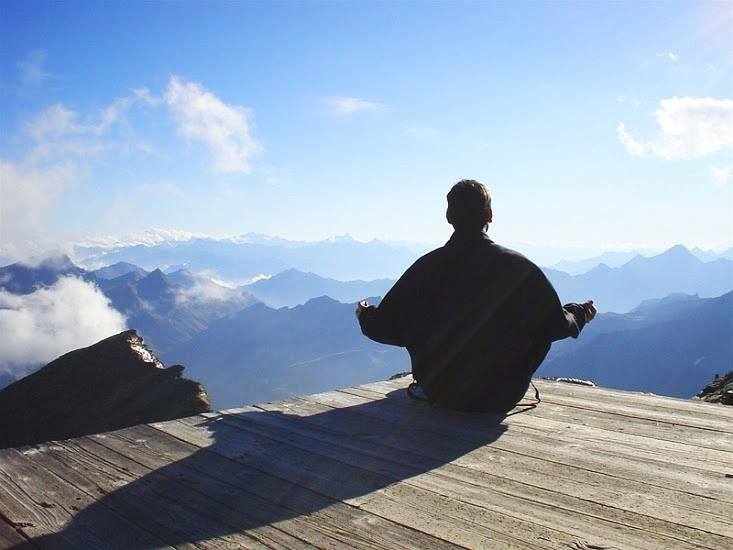 From the point of view of meditation and higher, expanded levels of consciousness. The ancient Sages and Siddhas have told us that relaxation of the mind is required to expand consciousness and for true inspiration to be channeled through to us. It is only when the mind is completely at rest, when the intellect is transcended, but awareness is still fully present, that we reach any state of true meditation (Dhyana). There is a lot involved in the stress response of our entire system. Both mind and body are involved. Viewing stress response as pervasive in this way, from one angle, seems overwhelming – even hopeless, but the encompassing nature of our system also means that there are many places and opportunities to interrupt the stress cycle and affect change for the better. Not only are there many places to interrupt and adjust the cycle, all that is required in most cases is to adjust the breath. The breath is key, because the breath is literally carrying our life. We can survive for a period of time without food, we can survive for a period of time without water, but survival without the breath is down to a few short minutes in most circumstances. So, from a psychophysical perspective, it’s no wonder adjusting the breath has a major impact on us. It is at the root of our very survival. Since the breath is crucial to our life – Many say breath IS life. Therefore, adjusting the breath has a great and in some cases instant impact on the quality of our life. In Yoga and meditation, we can harness this process to be our friend rather than our foe. This is where the mystical aspect of Ujjayi breath comes into play. The breath carries Life-force. Life force in yoga is called Prana. In order to concentrate the mind, we need high levels of Prana – We must be charged with Life-force. Similarly, in order to free the mind and open it up to expansion and intuition, the intellect must be transcended while awareness is retained ready to connect with and take note of new ideas, realizations and levels of intuition. The Ujjayi breath works on both the physical and psychic levels of our Being simultaneously. While it calms the nervous system through activating the vagus nerve more quickly than ordinary slower breathing, it also stimulates the hypothalamus, a part of the brain near the pituitary gland responsible for heightened awareness. Ujjayi Pranayama is an approachable and impactful breathing technique requiring minimal instruction and effort. It can be harnessed anywhere as an acute measure to calm the mind and body ‘in the moment’. It can also be practiced daily as part of general yoga practice, where its pranic benefits will be absorbed and stored up by the nervous system to cushion future episodes of stress. When prescribed by an experienced teacher, in conjunction with other more targeted, deeper meditation techniques, Ujjayi breath can be a powerful booster to the overall impact of meditation practice, enhancing both the quality and depth of experience for the meditator.